Even exes you hate the guts of? Even if you jump of the cliff, leaving the past behind, the feelings will stay with you - forever. 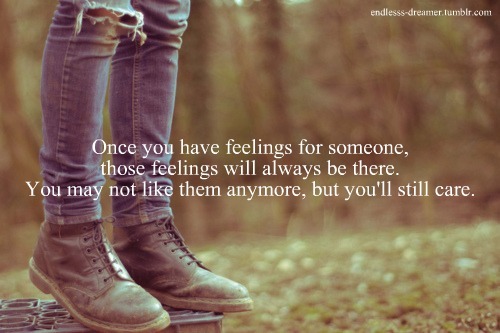 And then there are sadly those for whome you wish you had feelings. Sigh. P.S. I'm a Leo too! Right! sometimes they even put us in weird situations..
Read 3 posts now. I am glad that you did enjoy your birthday. One definitely needs to get over past as there is no good in fretting over something which can not be reversed. Let past be gone, live in present with lessons learnt in past and future will be what it will be. One should keep in mind that whatever happens, happens for good. I agree that one can not erase feeling in totality. It is advisable to keep fond one and let sad ones go. I know why should I? Thanks. For now, I seem to agree. Forever? Now, that hurt. Thanks. Thanks Jack. Everything happens happens for good. Just going with the flow now. I so agree with the words on the pic. If you don't its OK.